NEGAUNEE — The Buffalo Road Invitational basketball tournament has become a popular tradition with local players and on Sunday, it will return for its third straight season. Unfortunately, it could be the final season, with its Buffalo Road court scheduled to be refurbished within the next year. Tournament organizer Doug Lindblom said that last year’s event included about 100 people, and although the players had to battle poor weather conditions, it was a still a good experience. “We didn’t have very good weather last year, I remember that much, but we got it in,” he said. “There were a lot of the same guys from the first year that played in the second year’s tournament. The 3-on-3 tournament includes 10 teams with four players on each squad, many being former local athletes. The event has grown to have 21 sponsors, including presenting sponsor Jackson’s Pit Bar & Gourmet Grill, trophy presentation sponsor Anytime Fitness in Harvey and MVP presentation sponsor The Marq. Gravedoni Street Eats will also be at the game offering refreshments to both players and fans. The BRI begins at noon with “layup lines” and ends with the championship set for 6 p.m.
Lindblom said that once invitations to participate were returned, teams were chosen at random during a Facebook live broadcast. Lindblom said that they found out the games were going faster than expected so they moved up the tipoff for the title game, but other than that, they’re sticking with what has worked in the past. “We pretty much stuck with our roots and what we have,” he said. “The last two have been successful and you’d hate to ruin a good thing by changing it or trying to make it more complicated than it has to be. However, while the tournament may be simple, it may not last after this season. Lindblom said this will be the last year that teams will compete on the basketball court that makes the BRI such a unique competition, since the park will be going through changes that include resurfacing. “I’d say the future as it stands right now is probably uncertain with the resurfacing and the redevelopment of the park,” he said. “When the court changes and they renovate it, it will never be the same again. So, we’ll cross that bridge when we get to it. That’s what makes Lindblom keep bringing the tournament back each summer. 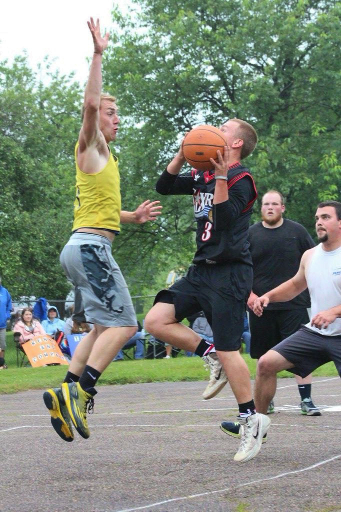 To show how important the Buffalo Road court means to not only him, but other players in Negaunee. With this potentially being the last year of the tournament, Lindblom urges fans to come out and experience a fun event. For more information about the tournament, visit the Buffalo Road Invitational Facebook page or follow the BRI at @BuffaloRdInvite on Twitter.